I’ve used a million products that claim brightening and radiance-boosting properties. Although I’d love to say that in testing all of these creams, gels, and serums, I’ve found the secret to a glowing, dazzling complexion, alas most of these products left my skin the same pale, blotchy hue I started out with. All of this trying and failing started to leave me feeling drab and disappointed—anything but radiant. I had even become resolve to the fact pale and pasty might just be my skin destiny. 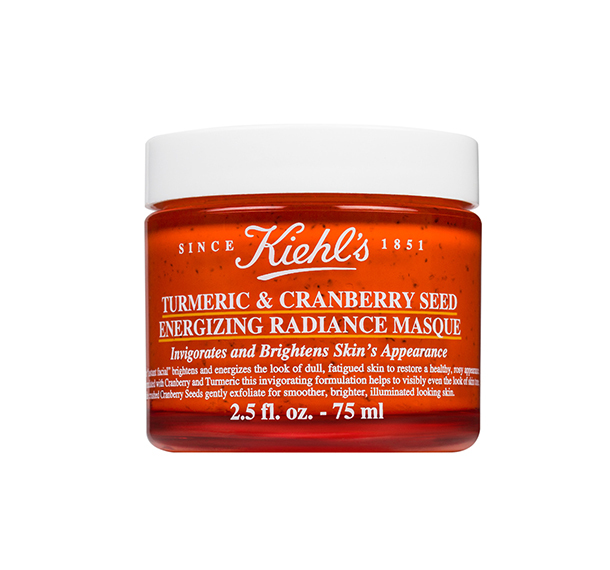 But when Kiehl’s Turmeric and Cranberry Seed Energizing Radiance Masque ($32, kiehls.com) hit my desk, I saw a glimmer of hope. With words like “energizing” and “radiance” right in the name, I felt a surge of optimism for my sad, tired skin. I was already getting won over from the second I unscrewed the top: It was an old-school, creamy face mask! (I must say I have a soft spot in my beauty-loving heart for masks like this. Something about applying a mask and waiting for it to harden—and potentially putting cucumber slices over my eyes, because why not?—just seems more relaxing to me than drenching my face with a runny, slippery sheet mask that I’m secretly convinced I put on backward.) Upon first application, this turmeric blend was thick and rich and smeared smoothly over my face. After applying the mask, I made sure to spread out the cranberry seeds evenly—they were a little awkward at first and tended to clump up. Ten minutes later, the mask stiffened and it dried to a yellow-orange hue—making it perfect fodder for my Snapchat story, I must say! After washing the mask off with warm water, the mixture softened and absorbed into my skin, as the tiny cranberry seeds very gently exfoliated. Although I personally loved the texture and ritual of the entire mask process, it was the formula that really impressed me. It actually made my yellow-y pale skin lively and dare I say it, radiant. Not only was my skin smooth and supple after rinsing (a trait that’s rare with the old-school hardening masks I love so much), but it was noticeably brighter and luminous. Thanks to anti-inflammatory turmeric extract paired with cranberry extract and cranberry seeds, which are rich in resveratrol (a top antioxidant and anti-aging ingredient), this mask actually made my skin glow in 10 minutes. And as if that wasn’t enough, it got better the next morning. That’s right, my skin was actually better the next day. Because I felt so hydrated after washing, I didn’t need to pack on the moisturizer that night, thus allowing me to wake up with non-oily, still nourished skin the next day. Plus, for the first time in my adult life, my skin tone was even, if only for a day. Cue tears of joy now. Have I found the secret to a glowing, dazzling complexion? I’ll probably always be on the hunt for that. But at least I’m one step closer.